Utilities are reverting back to the mean recently. They have been dropping in share price which is excellent since I've been waiting forever to add to utilities. I will dollar cost average my way down on my favorite names. WTR is a water utility and will be a new position. I consider WTR to be fair value at this moment. It is also very oversold using the MACD and RSI indicators. 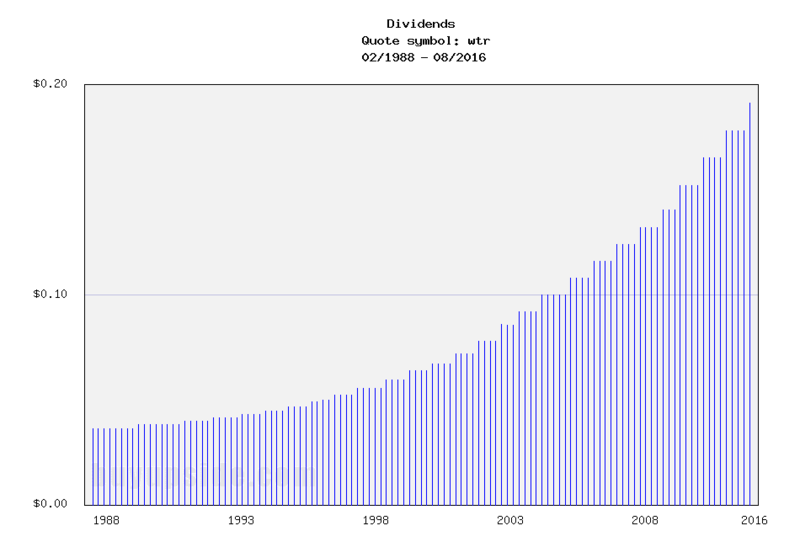 WTR has 25 consecutive years of dividend increases. It is one of the most consistent graphs in the utility space. 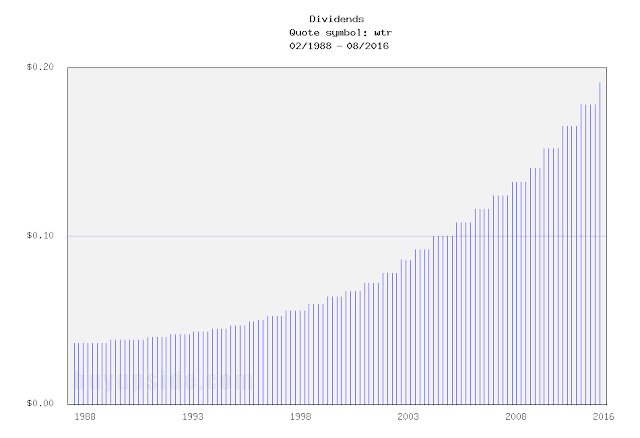 It is a dividend aristocrat. They have paid dividends for a long time and are one of the most consistent water utilities in increasing their payouts. They also grow their dividends at a higher rate than other water utilities. WTR iss my type of company, with its consistent increasing earnings, increasing dividends, and moat. WTR is a high quality company with a good credit rating. 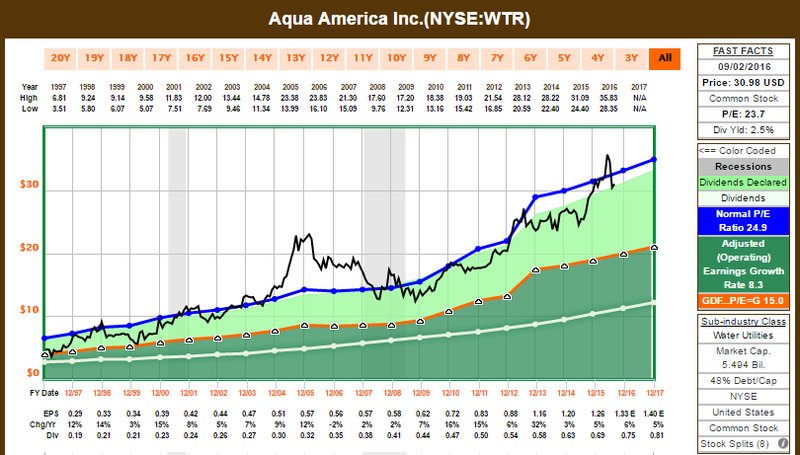 Although I cannot find a credit rating for WTR on S&P, I do have the credit rating for bonds for their largest subsidiary, Aqua Pennsylvania which is more than half of their revenues in 2007. Aqua Pennsylvania is rated A+ by S&P in 2012 link which is great. Value Line gives WTR a A in financial strength. The only competitor that is higher is AWR which also has an A rating, and AWR is a much more established dividend company with 61 years of dividend increases compared to WTR's 25. In terms of safety, Value Line gives WTR a rating of 2, with 1 being the highest. Value Line has no 1-rated water utilities that I can see so WTR is as good as it gets along with AWR. I have noticed that utilities often have lower security and financial strength than large C-corp blue chips like JNJ and PG and MMM. The other high quality water utility I like is AWR which is a very established dividend aristocrat. The reason I did not purchase AWR is because it's still over valued and it grows earnings and dividends more slowly. They are not as consistent in increases as WTR and AWR has had a recent spike in earnings in 2008-2013 which wasn't normal since it was relatively growth-less for a long time. Nice buys! WTR seems like a great stock and it certainly has a fantastic history of dividend increases! All the best and happy investing.